My friend Mervat, a beautiful mother of three, a scientist, and a writer from Australia also nominated me for an award this week. I must tell you that this is the best kind of recognition. To know that people are reading what I'm writing and thinking about me in this way - well it warms me. Mervat's posts are genuine and just plain lovely. Two of my favourites are Brave & Generous Kayleigh and My tender child. I hope you will go and visit and see for yourself. The Your blog is fabulous award asks that I list five of my least favourite things. Only five?? -I really dislike construction. In our city - I'm sure it's like this everywhere-just about every major road gets torn up and detoured for most of the summer. Getting to work in the morning takes an extra 10 minutes at least which translates into getting up earlier, rushing around - you get the picture! -I'm weak when it comes to yummy food. Here's my question. Why do fries and gravy cost less than a salad or sushi? Why does eating healthy have to be made even more difficult? -I find this conflicting message a bit frustrating - stay out of the sun but get Vitamin D. So I lather Deaglan with SPF 50, cover his head with a hat and then give him a Vitamin D supplement. -All the good shows end at exactly the same time every spring and we are left with reruns all summer long. Shouldn't cable prices go down to account for this?? -Bathing suit season. I'll just leave it at that. I love so many blogs and it's really difficult to narrow down just a few to honour with this award. If I didn't include you, please know that a more fitting award will be coming your way soon. All of these women are fabulous in my books. I hope you check them out and get hooked like me. Congratulations! THis is most dserved. And you are so kind in your words to me. THank you. Congratulations Kim!! You deserve this award so much:) You know I'm one of your biggest fans. 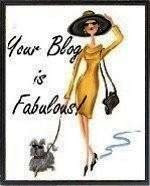 Your blog is off the charts when it comes to FABULOUS!! Congrats to the other recipients too. I'm glad to visit their blogs today. Kim, A big Congratulations on the award! I'm always checking out your blog. I love the pics and posts. Construction really gets to me too! I feel like there are sometimes detours to detours around here! Congratulations Kim!! :) You so deserve the award.Your blog is great!! Congrats once again! Kim! Thank you! You are so nice to pass this my way. I love your blog and I DO think it's fabulous, so I'm flattered. Oh my goodness! Thank you so much - I'm so honored! I love your list, and I'm with you re: bathing suits. UGH! BTW the Vitamin D thing gets me too.